Quickly cool, hang and perfectly age game meat the way professional butchers and game processors do. Game Lockers will give you additional room for storage while keeping your meat fresh and cool. Our game walk-in coolers have an overhead rail system with sturdy game hooks to hold meat. Perfect for storing deer, turkey, or any other wild game. Can be used year-round for storing other food and beverages. 4” thick insulation which reduces wear and tear on the refrigeration system. Self-contained, saddle mount refrigeration system. Overhead rail system with gambrel and hoist to hold meat (8 gambrels with 6X8, 6 with 6X6). Keyed lock in handle with two keys. Shelving – options available upon request. 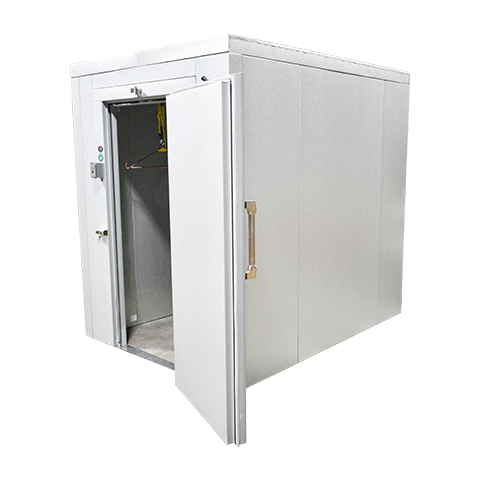 Game Locker cooler without floor should be placed on a level concrete pad. Step by step installation instructions included. Requires 2 people and 2 hours to assemble. Call 800.521.2665 to be connected to a dealer near you. Or fill out out this short online quote form for a Meat & Game Locker quote. 5'10" x 5'10" x 7'6"
7'10" x 5'10" x 7'6"